Let's pretend that climate change is a lie. Just for the sake of argument, let's suppose the whole climate change business to be complete and utter nonsense orchestrated by a liberal elite who want to somehow use it to kick God out of schools, allow gays to recruit, and usher in a Marxist regime that will do terrible things like make sure every old lady has a flu shot. Or whatever it is that the crazies believe. It's the Jews. The Masons. The Bilderburg group. The Illuminati. Whatever. Even if you do that, even if you remove the issue of climate change entirely, wind power is still a good idea. 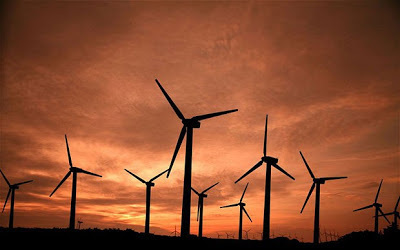 And each time I see another intolerable idiot complaining about wind farms it makes feel sad for the whole human race. If you are reading this, you are implicitly, through that simple act, agreeing upon a need for energy. These words exist in the great, amorphous electronic space, and all around the world energy must be created in order for them to exist and for you to see them. So the issue of energy creation is not up for debate; we need energy, or, at least, we want it so basely that it is effectively a need. One of the least unpleasant ways of satiating that need is through wind energy. But it's not efficient, say opponents. True. At the moment, wind farms can be less efficient than coal, natural gas and, especially, nuclear power plants. But with that lessened efficiency comes increased peace of mind. Windmills don't explode. In an absolute worst-case scenario the base or blades can snap, which can litter debris for several hundred yards. But that's debris that doesn't require special skills to pick up. No one has to put on an anti-contamination suit. Ground water doesn't get destroyed. Eco systems are not ruined. The lives of people in surrounding towns are not put at risk. But a more efficient means of power generation will eventually come along, say opponents. And almost certainly they are right. One day, perhaps, as Michio Kaku suggests, man may be able to create energy by bending space and time. But we need energy now. Populations are increasing and more simply, power plants, like all things (knees, bicycles, one's interest in "X Factor," etc. ), wear out and will need to be replaced. The benefit of wind power in this situation I've already touched upon: they don't contaminate an area. When we eventually come up with that super-efficient, not-at-all-bad-in-any-way method of power generation, we can tear down the wind farms. And what will be left? Fields. Not brown fields, as would be the case with a power plant. Not a contaminated site that millions upon millions of dollars must be spent cleaning up. Not a space unfit for human or animal use. Just a load of fields. All the metal could be sold for scrap, the concrete bases ground down, and within the time it takes grass to grow, evidence of the wind farms would completely disappear. Which kind of answers the biggest complaint from opponents: that wind farms are ugly. I don't even really agree with that, personally. I think they look cool and they don't necessarily spoil the scenery they are in. But they certainly don't spoil it any more than a power plant would. For example, here's a picture of Carno wind farm in mid Wales. And here's a picture of Didcot Power Station in southwest England. Which would you rather wake up to in the morning? Which place would you rather call home? Didcot uses natural gas, coal and oil. Ignoring those environmental loonies who consistently lambaste it as one the most-polluting sites in Britain, where would you rather take a deep breath? Where would you rather raise children? Where would you rather to have been raised as a child? I have passed through Didcot many times on the train, en route to or from London, and each time I see its chimneys and cooling towers I am filled with a deep sense of unhappiness, as if the whole world is conspiring against me. I can only imagine the deep hatred I would possess toward myself and all other things had I grown up in its shadow. Meanwhile, I often go out of my way to go hiking in the hills and mountains where wind farms are present. Additionally, it is quite often the case that wind farms are built offshore, becoming nothing but white sticks in the distance. White sticks you cannot see if the visibility is less than perfect. White sticks that create habitats for sea creatures. White sticks that in no way pollute the water you're swimming in. It baffles me that people could get themselves so worked up against wind farms. I am convinced that there is something deeply wrong with them, that they have transmogrified the issue of wind power into some other thing in their mind. And like Don Quixote, they are making utter fools of themselves as they continue to tilt at windmills.